Laura, Jeff and I felt good about the service we planned for Mom. After it was over, people told us they wished they had known her. We considered that a big compliment. We kept it simple. Patrick opened with his memories of Mom as someone who was simultaneously strong and vulnerable, and whose heaven would be a place at the Algonquin Round Table, with people acting a bit inappropriate and cigarette smoke swirling in the air. Laura spoke about Mom’s unconditional acceptance of who we were. No pressure, no disappointment if we made mistakes or, in Laura’s case, didn’t make a cheerleading team. Or, rather, no disappointment for herself, but real concern for us when we faced disappointments in our young and adult lives. Laura read a poem that she wrote about Mom, which I published in this blog years ago. Jeff talked about how music had been important in our household, especially to him – music is his profession. He played Mozart on the funeral home’s keyboard, and completed the service by leading a sing-along of “If I had a hammer.” The Peter, Paul and Mary version of that song had come up on his iPod while we were with Mom, and it struck us as a good reflection of her interest in social justice. Jeff, Laura and me outside Studio 35 Cinema and Drafthouse, which put Bonnie’s name up in lights for the occasion. Julia and Lily, Mom’s granddaughters, each shared how they remembered Grandma. Lily had observed as a little girl that Mom had a tendency to wear striped shirts – and after that, Mom wore stripes for every airport arrival so the girls could find her, and to poke fun at herself. Julia recalled a moment of silence with Mom in the back seat of a car during her “teen angst” years – not an awkward silence, but a quiet show of support from a grandma concerned about Julia’s bad mood. Many old friends of Mom’s and of ours visited to express their sympathies at the calling hours. And we had a nice turnout for the service – we really didn’t know what to expect in the way of numbers. 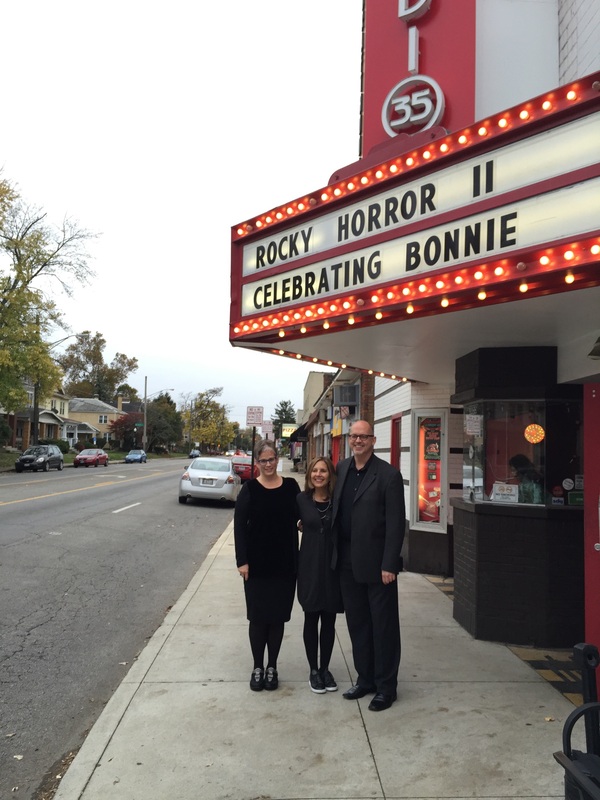 We followed the funeral home formality with a party at a local cinema and drafthouse, which attracted additional friends as well as those who had made an entire day of celebrating Mom. If you’re interested in seeing more images of Mom, the funeral home posted a video slideshow on its website. I am way behind in thanking friends, family and readers for their kindness, and I have been touched by people who have asked what would happen to the blog. I will keep writing this blog for as long as it makes sense. There is much more to remember. At this moment, Mom is still breathing. But the breaths are “not life-sustaining,” according to the nurse who called this morning. I would have said the same things about her breaths yesterday, or even Sunday night. Her relative physical health seems to be sustaining her still, long after her brain turned against her. Mozart is blaring from my phone. Jeff left his iPod here when he and Laura flew home yesterday, but its battery ran out overnight and I forgot to bring a charger. The three of us got a lot done while they were here. More importantly, the prolonged time together strengthened our bond. In Mom’s room, we laughed a lot, selected photos for her service and shared memories, but also lamented her illness and had varying and unpredictable emotional responses to her imminent death. Lots of 3-way hugs, and a renewed sense of our love for each other. Agreements to leave Mom’s side and then an agreement to stick together when I had an unexpected moment of crisis late Sunday. I believed she would die that night, partly based on how she looked and under the influence of a hospice nurse who suspected she couldn’t survive the night. (No one else has spoken so definitively about Mom.) “I feel like I have to see it through,” I said. “It’s my job.” Forty-five minutes later, we left. We needed rest for the day ahead, our only chance to work on funeral arrangements. Monday morning, she was still here. I got a call last evening that she had made a sudden transition. Patrick and I raced back here. An hour later, she had not changed. We returned home. And here she still is this morning, surprising her entire care team. Those who know me and/or read this blog know I am not a believer in total sacrifice of my own health and life as a caregiver for Mom. The dying process has challenged me somewhat, in that I did expect I would want to be with her at the moment of her death. There is the question of whether she would want any of her kids here when she died that influenced my ease in leaving her from time to time. There is the pain of looking at her in this state that makes me need to leave sometimes. And my own health concerns me. My resting heart rate had been near or above 100 since Saturday, causing me to feel like I am having the longest hot flash ever recorded. When Mom was in distress and I could speak in a comforting way to her, I wanted to be here. But she has been unresponsive since midday Sunday. We talked to her and kept music in her ear, not knowing if anything got through. I am here today because concentrating on anything else is impossible. I feel stress about missing work, but I don’t trust my ability to perform well while waiting for the call that my mother died. Nurses and I have recommended to her today that she let go. I just blasted Handel’s Messiah when it came on, inviting her to go out to that music that she loved so. It may seem inappropriate to wish strongly for a mother’s death. But if anyone has earned the peace of eternal rest, it is Bonnie Caldwell. I played canned classical music from my phone until Jeff arrived with an iPod loaded with Mom’s favorites: the Magic Flute, Der Rosenkavalier, Barber of Seville, Ravel piano concerto and Resphigi Ancient Airs and Dances. Today, Peter, Paul and Mary. Laura and I are singing along. Patrick’s here, too. She tolerated the ear bud like a champ. In my mind’s eye, Mom had a bad day Friday. She experienced more agitation than I have seen in quite awhile, since she became more withdrawn and immobile. I arrived just as an aide was changing her and repositioning her. I could hear her yelling from behind the closed door. Her lungs are strong, I thought to myself. I went in and sat, and as I had on Thursday, I cried a little. I thought and said to Mom, “I’m sorry this is happening to you. I’m sorry for all you’ve been through.” Though I have expressed multiple times that I want her suffering to end, that doesn’t take any of the sadness away. And that has taken me a little bit by surprise. Mom was twitchy and her eyes were open. She vocalized a lot, and with little voice left, it sounded like groans of distress. I talked soothingly to her but I wondered if the repositioning had left her in pain. I asked the aide if she could have some medicine. He checked with the nurse, and said it was too soon – presumably for morphine. As time passed, and she tried to pull the oxygen tubes out of her nose repeatedly, I went to the nurse station to ask for Ativan. I stood there while two staff members kept their heads down, working. I imagine that when there are patients approaching all day long, this is a strategy to get work done. But it pissed me off. “May I ask you two a question?” I said. “I’d like for my mom to receive some Ativan. She’s obviously agitated.” “I’m in medical records,” one woman said. “I do speech therapy,” the other said. “But we want to help.” An aide arrived at that moment and said she would look for the nurse, and I thanked her. I waited with Mom. I stepped out once to look down the hall, and the aide caught my eye. I waited some more. For those who have seen the movie Terms of Endearment, when Shirley MacLaine screams desperately at medical staff to give Debra Winger some pain medicine – well, I was about to go Shirley MacLaine on this place, with a staff I respect very much. I stepped out into the hall, and the nurse was walking toward me, mixing the medicine in a cup. Mom was so interested in the medicine that the nurse offered her some applesauce, and that seemed to make Mom happy. Even when someone has stopped eating, it’s OK to give her food if she wants it – I learned this from the hospice nurse later. Mom eventually relaxed, and I Ieft for a few hours. Mom would not let go of the oxygen tube. She used her other hand to pull the tube away from her nose. When I returned in the mid-afternoon, she was agitated again, but had recently received morphine. So the nurse told me she expected Mom would settle down. We gave her some applesauce and fed her a high-calorie protein drink with a spoon. I did most of the feeding over time. Mom eventually didn’t open her mouth for the drink anymore. And then her agitation returned. She pulled at her sheets, flailed her arms, groaned nonstop. She pulled the oxygen tubes out of her nose countless times, and I returned them, to her dismay. I massaged her arms, hands, head and the side of her back that Ic could reach. The back rub provided brief relief, and she quieted. But soon she was restless again, and she occasionally cried out and grimaced. I couldn’t stand it. I was about to beg for more Ativan when the staff nurse and hospice nurse arrived. We agreed to start scheduling the Ativan at regular intervals to reduce the likelihood of more agitation. It’s discouraged if someone still walks, because it increases the risk for falls. That is not a concern here. Mom received morphine and Ativan and fell deeply asleep, finally. Her breathing was regular. Her heart rate had decreased to 91. I could finally leave. I think Mom smiled when I said hello to her today. The nurse seemed to think so, too. I sat with her for about four hours. Her eyes were open at first, and I gently stroked her forehead and rubbed some oil into her hands. She has some involuntary muscle movement now, so it was hard to tell if any of this was soothing. A maintenance man came in, saying he had been instructed to look at her bed. She is on an air mattress because of the open wounds on her feet – to avoid any more of those skin problems. I hadn’t realized it, but the bed was completely deflated. The maintenance man jiggled the plug and the bed inflated immediately. Sometimes that’s all it is, he said. And within minutes, Mom was fast asleep. Poor thing was probably really uncomfortable not because of her disease, but because she was lying on a deflated mattress over a metal frame. She then slept while I did a crossword puzzle and read a book. 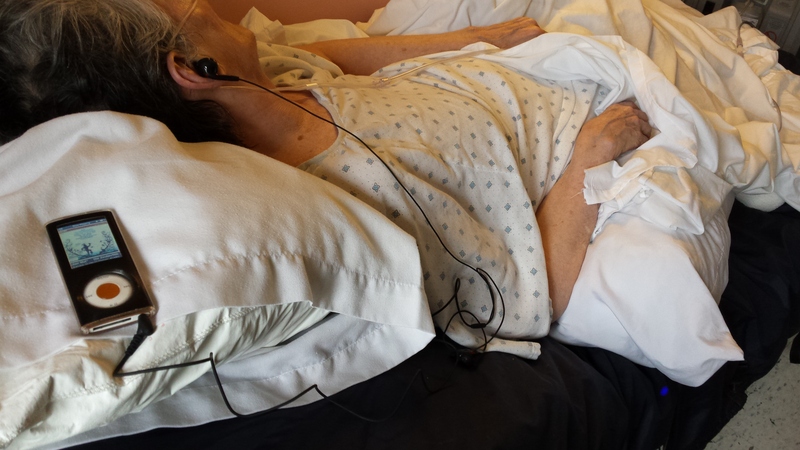 The Alz center nurse who has led her care for the past several weeks gave her meds – regular doses of morphine and drops to help clear secretions in her upper airway. Later, the hospice team arrived. An aide swabbed Mom’s mouth, which really needed a good cleaning. And the nurse checked her vitals, turned up the oxygen and decided, mutually with the staff nurse, not to change the dressing on Mom’s foot sores anymore. Changing the dressing just hurts her, and there is no point now in trying to heal those wounds. I was in favor of this decision, too. 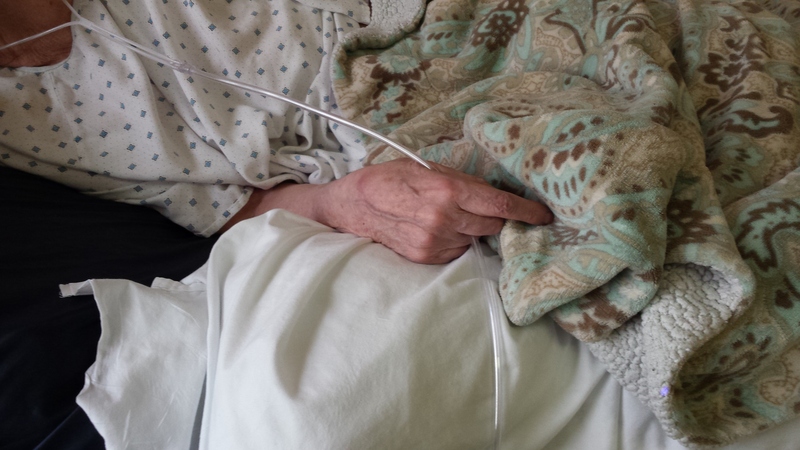 Mom cried out when the hospice aide repositioned her on the bed. There is pain there even with the morphine. By the time they left, though, she was resting comfortably again. Her pulse is very fast, 143 beats per minute, and she is showing some signs of labored breathing. No gasps, no pauses. But a heart can take only so much racing, and the lungs can circulate oxygen under compromised conditions for only so long. She ate a full meal Sunday and refused food yesterday. There was no attempt to feed her today. I talked to her, told her a few times that Laura and Jeff are on their way. I am not keeping a 24-hour vigil at this point, and am not sure what we’ll do when we’re all together. A friend who had both parents in hospice at the same time (an unbelievable thing to happen to an only child) said she was advised to have a visitation schedule and not to stay 24 hours. That way, the parents could time their death when she was there or when she was not, depending on their preference. I have heard a lot about a dying person’s preferences in the past few days. There seems to be a strong belief among those who work with the dying that we have some control over this last act. I am not going to try to guess what Mom will choose. Patrick and I made good time on our trip back home. It was a beautiful day for a long drive. My mood has been stable except for when Patrick’s mother called this morning to wish us a safe trip, or when I read kind and supportive comments on Facebook, this blog, in email or in texts. “I know it’s a rough time for you,” my mother-in-law said when she called. We were both choking up. She has been through this – with her husband, which I imagine is exponentially more painful. So many people have been through this with parents, too. Of course I will miss Mom and this is a rough time. But I want this to be over for her because now what I see when I look at her is suffering. And I have missed her for a long time. When the hospice social worker asked me during the admission process how I expected I would feel when Mom dies, I said that I worried I would never remember what my relationship was like with her before she got sick. My brother and sister are flying in Friday night. I imagine we’ll share stories, and they will help me remember. 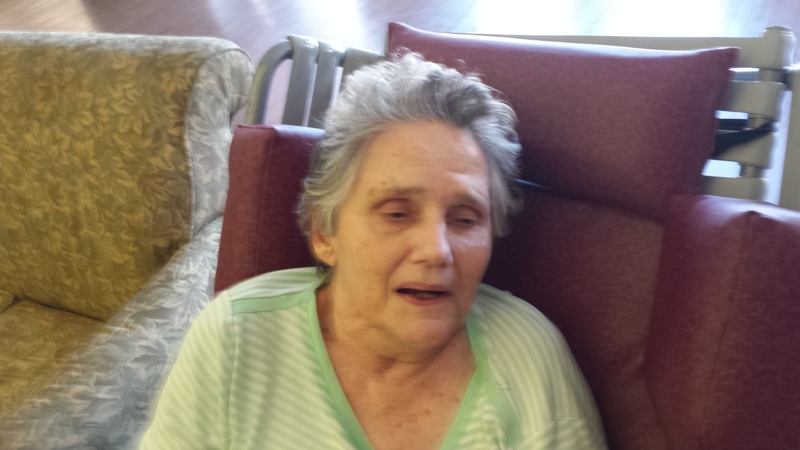 This is the most recent photo I took of Mom, when she was having a good day and was very alert during lunch – there is even a hint of a smile on her face. Mom improved a little bit today. She was more alert and even tried to have a laugh with a nurse. She was not interested in eating, but she did enjoy receiving sips of juice. The fever she had yesterday, which seemed like a bad sign, was gone today. But a new wound opened on her other, previously healthy, foot. When Patrick and I entered her room, an aide tried to prop Mom up a little bit in bed so she could look at us. I was surprised that she did this, because I just wanted Mom to be able to rest and let us look at her. But she was trying to be helpful. “So she can see you,” she said. Mom is receiving steady doses of morphine and she is typically asleep by 7:45 p.m., which was about the time we arrived. The upper part of her bed is elevated to keep her somewhat upright, presumably to reduce the complications of aspiration. She is producing a gurgling sound in her upper airway, which the nurse described as a signal that the dying process has begun. She had oxygen tubes in her nose – this is strictly for comfort, not to prolong life. She moved her mouth from time to time as if she were dreaming about eating. She had some involuntary spasms, which I have noticed for awhile. She didn’t look quite comfortable enough for my taste. But I’m hopeful that anything that looks like distress to me is something her brain doesn’t register. We held her hand and she seemed to respond to that touch, at least a little bit. The nurse said she does still seem to be trying to communicate. At one point, she briefly grimaced. I hope we didn’t hurt her with all of our touching. Tomorrow I’ll be back to watch her during the daylight hours, and to quiz the hospice social worker, who said she plans to look in on Mom. Even if the dying process is in progress, which appears to be the case, I get the feeling it is impossible to predict how long it will take. The signs of Mom’s decline are not just behavioral. Her skin seems to be breaking down. She still has one wound on her foot that won’t heal, and another wound has opened. She also has black spots on her feet – a sign of deterioration under the skin. And she has an abrasion on her knee. I thought I might have caused it – I wheeled her into a table by accident on my first attempt to “drive” her wheelchair. She yelled out in pain, but I would never have guessed that it broke skin – a bruise, maybe. But I think it doesn’t take much to cause her body harm at this point. A nurse thinks it might have resulted from Mom’s knee hitting the wall next to her bed, so the staff have put an air mattress between her bed and the wall. Mom has been moved out of the Program Area at the Alz center – the bustling, open space that houses most activities and patients who are fairly mobile and functional. The social worker called to ask me if it would be OK if she moved to the skilled nursing side of the building, the place many patients go when they have declined substantially and require more care. I guess I could have said no, but I think deferring to the facility’s request makes sense in this case. She is too much for the Program Area staff now. Leaving the Program Area is a loss for me, if not for Mom. She has been there for six years so I am familiar with patients there, and the staff, and the atmosphere is welcoming. But I like the idea of Mom having more care, especially with her skin problems and the potential pain they’re causing. A nurse called me today to tell me about the second wound, and I asked if these wounds hurt. She said she will ensure Mom is being treated for pain because we just can’t tell. But chances are something like this WOULD hurt – assuming pain signals are normal, which they might not be. Mom is in a new dining room for meals now, and I have fed her there twice and missed one week while I was sick. In the two weeks between lunches, she deteriorated visibly. Yesterday, she seemed to be in distress – she was tense, which I attributed to her probably being cold, and she had more than the usual number of involuntary whole-body tremors. She kept her eyes closed and her head tilted back, and occasionally let out a slow moan. It was terrible. She did not do very well chewing meat – a first in my experience – so I fed her mashed potatoes and a few carrots and lima beans, but focused on giving her the whole bowl of high-calorie cereal – the consistency of cream of wheat – that she gets with every meal and the filling from a piece of apple pie. I do believe she will still appreciate a sweet taste in her mouth. It was almost as if she was just refusing to wake up, but it created a choke hazard, I thought, because she would not raise her head. In fact, for most of her meal, I stood and kept one hand behind her head to keep it as upright as possible. I couldn’t tell if she just refused to wake up or was unable to, or if even in an awake state, she can no longer control her body in the way she wants to. The nurse who called today said the skin problems could be a sign that Mom might be ready for hospice. I have wondered what would trigger that. The nurse seemed to be treading lightly, and I told her: “Don’t be shy about talking about this. I think Mom’s existence at this point is awful and sad, and I wish she could fall asleep and not wake up.” I’ve said that before to friends, but I don’t think I’ve written it, and I’ve never said it to the staff. And she said, “OK, good to know. I wasn’t sure.” I’ve known her for awhile, but we are bonding a bit more now in talking about Bonnie and how to make her as comfortable as possible. Another daughter was in the dining room with her mother yesterday, and we caught up briefly. We both used to go to support group, but we’ve both stopped. Her mom looked alert and is a good eater, but she has been in a wheelchair for years. She spent six months in hospice but was released because she kept surviving. I said about Mom, “She’s a wreck. I have never seen her this bad.” And she said, “It’s a long road.” You better believe it.